One out of every 12 adults in the United States suffers from alcohol dependence, making alcohol the most regularly used addictive substance in America, the National Council on Alcoholism and Drug Dependence (NCADD) reports. Drinking large amounts of alcohol regularly can cause the brain to get used to the way that alcohol interferes with neurotransmitter transmission, movement, and absorption. When alcohol enters the brain, it causes levels of dopamine and GABA (gamma-aminobutyric acid) to be increased. Both are chemical messengers that the brain normally uses to tell the rest of the body how to feel. Dopamine affects pleasure sensations, motivation, sleep functions, memory, and learning, while GABA is involved in mitigating and controlling the stress reaction. As levels of GABA increase, the central nervous system is depressed, slowing breathing, heart rate, and blood pressure, and lowering body temperature. Alcohol disrupts regular levels of these neurotransmitters in the brain, and the more the brain becomes accustomed to the artificial interference, the more it will rely on alcohol to keep these levels stable. After a person becomes dependent on alcohol, dopamine and GABA activity is altered, leading to uncomfortable and even dangerous withdrawal symptoms when they try to stop drinking. Alcohol is a substance that should never be stopped “cold turkey” without professional intervention, care, and supervision. About half of all people who are dependent on alcohol will suffer from withdrawal symptoms when they stop drinking. The New England Journal of Medicine (NEJM) warns that 3-5 percent of individuals will struggle with grand mal convulsions, delirium (significant confusion), or both. This severe form of alcohol withdrawal is called delirium tremens, or DTs. In addition to confusion, agitation, hallucinations, and tremors, individuals may also experience dangerously high fevers. Grand mal seizures, hyperthermia, cardiac arrhythmias, and complications related to co-occurring medical or mental health disorders can make DTs fatal if swift medical care and attention aren’t provided. Alcohol withdrawal symptoms typically begin within about eight hours after the last drink and peak in about 2-3 days, the National Library of Medicine (NLM) publishes. In the case of DTs, symptoms may not appear for up to three days after stopping drinking, making them even more potentially dangerous since people may believe they are in the clear and not have medical care accessible. The extent and severity of the side effects from alcohol withdrawal are related to how significantly dependent a person is on it. In general, this means that someone who drinks heavily on a regular basis for a long time will suffer the most. Also, mixing other drugs, particularly central nervous system depressants like benzodiazepines (e.g., sleep aids, anti-anxiety medications), with alcohol can increase levels of dependence and further complicate withdrawal. The presence of any underlying or co-occurring mental health or medical issue can increase the hazards and intensity of withdrawal as well. Alcohol dependence and bouts of regular drinking may lead to malnourishment, as individuals may eat fewer balanced meals, and alcohol withdrawal can cause gastrointestinal upset and appetite loss. Alcohol can deplete the body of essential vitamins and nutrients as well. For instance, alcohol can lead to a deficiency of thiamine (vitamin B1) in the body, which the National Institute on Alcohol Abuse and Alcoholism (NIAAA) reports up to 80 percent of people battling alcohol addiction suffer from. A thiamine deficiency can cause a person to develop Wernicke’s encephalopathy, a disorder that can lead to significant mental confusion, loss of control over eye movement, and a lack of motor coordination. NIAAA warns that about 80 percent of the time, Wernicke’s encephalopathy develops into the debilitating Korsakoff syndrome. Trouble forming new memories, problems with learning, and confusion are symptoms of Korsakoff syndrome as is confabulation, which is when a person “makes up” information to fill in memory gaps. Learning and memory deficiencies coupled with impaired motor skills make Korsakoff syndrome a serious disorder that requires specialized treatment; only about 25 percent of people will fully recover from the disorder, Alzheimer’s Association publishes. Dehydration is another potential side effect of alcohol withdrawal, and this can cause a massive electrolyte imbalance in the body. Alcohol dehydrates the body in and of itself, and the nausea and diarrhea that often accompany alcohol withdrawal only exacerbate this. Severe dehydration can cause mental confusion and a disruption of the autonomic functions of the central nervous system, further increasing the potential complications of alcohol withdrawal, which can be very dangerous. High levels of anxiety and depression can also be difficult during alcohol withdrawal and may lead to suicidal ideations or self-harming behaviors. Alcohol withdrawal can be intense and uncomfortable. The side effects and strong cravings for alcohol often make it difficult for people to avoid relapse without a stable environment and professional help. According to information gathered and presented in the journal Alcohol and Alcoholism, somewhere between 0.6 percent and 40 percent of all emergency department (ED) visits involve alcohol-related issues. Many of these problems are related to alcohol dependence and likely alcohol withdrawal symptoms. Based on information collected between 2006 and 2010, nearly 90,000 people die annually from excessive alcohol consumption. On average, the lives of those who die are shortened by an average of 30 years, the Centers for Disease Control and Prevention (CDC) publishes. Dangers related to alcohol withdrawal can be prevented and minimized through medical detox; hence, medical detox is always recommended in cases of alcohol withdrawal. In a medical detox program, an individual will check into a specialized facility where they can safely stop drinking and allow the toxins from alcohol to process out of the body. Instead of stopping cold turkey, alcohol may be slowly tapered off to keep from shocking the system. Medications, like long-acting benzodiazepines, may be used to replace the alcohol in some instances. Other pharmaceutical tools are beneficial in helping to manage specific symptoms of alcohol withdrawal. Sleep aids, antidepressants, mood stabilizers, nonsteroidal pain medications, and gastrointestinal medications can be helpful. 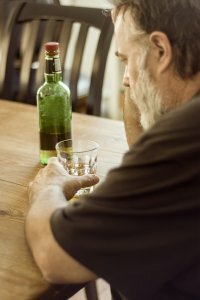 Other medications, like topiramate, a nerve pain and anticonvulsant medication that increases levels of GABA while reducing the excitatory neurotransmitter glutamate, may be used off-label to treat alcohol withdrawal and dependence as well, the National Institute on Drug Abuse (NIDA) publishes. During detox, fluids can be given to prevent and reverse dehydration, and nutritional balance can be restored via balanced meals. Medical providers monitor vital signs and mental health status around the clock to ensure each client’s safety during medical detox. The encouragement, supportive and calming environment, and therapeutic methods provided aid in relapse prevention. An individual will remain in a medical detox program for between five and seven days on average. Of course, the exact duration of stay will depend on the needs and progress of the individual client. Detox can address the potential hazards related to alcohol withdrawal and minimize possible complications while helping a person to become physically stable and ready to enter a comprehensive alcohol addiction treatment program directly following withdrawal. Detox is an essential first step, but it should be followed by a complete addiction treatment program that includes behavioral therapies, counseling, support group participation, medications, and complementary therapies.